It was announced on November 24 that the clearance of Mong Kok would begin within 24 hours, with all objects on Nathan Road between Argyle Street and Dundas Street targeted for removal. An article on Apple Daily quoted a driver employed by the Chew Association Minibus Company 潮聯公共小巴公司, which had been one of those applying for the court injunction. Although it applied for the injunction, claiming losses and damage to business, the man argued that his income had actually increased after the protests – to the effect of gaining an extra $200 per day. Mong Kok’s long been known as the more radical protest site, the place where more people who disagree with the control of the Big Stage, HKFS, Scholarism, and Occupy Central will gather (as in this photo I took back in mid-Octboer) to participate in the “Umbrella Revolution,” not in the “Umbrella Movement” – and divisions between radical groups that emerged after the storming of the LegCo continued there. A sign at the foot of the Guan Yu altar condemned People Power, as shown in this tweet. The clearance began, as warned, on November 25. I thought that the protesters might behave in ways similar to previous clearances of posters – put up no fight during the day, then return by night. But I was wrong – Yvonne Leung was there to ensure the clearance was carried out with proper legality. I can’t quite characterize or compare this to what Joshua Wong did with the partial clearance of Admiralty, since I wasn’t at Mong Kok. People were also moving out their belongings in Mong Kok in preparation for the clearance; everyone’s favorite protester, Shirtless Graffiti Guy (also known as the 畫家 (painter) at Mong Kok, Eric) reclaimed a small Captain America shield that has been staring police in the face ever since they took back the intersection of Nathan and Argyle. Other leaders like Long Hair were also present – this tweet shows both him and a “pro-China parade” at the scene. What I found interesting – a bit tongue in cheek as well – is that the bailiffs’ and police announcements were answered by the protesters with demands that they speak in English. Such demands were extremely rare in the early days of the movement; as I mentioned before, it was typically Martin Lee who delivered parts of his speeches in English. Part of the demands for English are, I think, related to the mocking of “Hui Sir,” the police spokesperson who gives updates at 4pm in Cantonese before recapping in English. Another part of it, the more utilitarian reason, is to ensure that journalists and foreign media understand what is happening – and this is interesting precisely because it plays on the assumption that the only people in the crowd who will need English are “foreigners,” overlooking any local pro-democracy protesters (such as “expats” or “ethnic minorities”) who do not speak Cantonese. Even more interestingly, it was a white police officer that evening who seemed to point out this problem as he yelled at journalists to get out of the way. He and a few other white officers have stood out in the protests because of their race. The next night, another white officer was the target of a protester’s angry questions. I wonder why he singled out the white officer, as opposed to any of the other Chinese officers (though of course one documented instance of him yelling at a white officer doesn’t mean that he didn’t ask the same question of Chinese officers). This SCMP story suggests that the clearance that day went smoothly, and it describes the measures used by Yvonne Leung and other protesters to demand transparency from the bailiffs and police. Chief Superintendent Steve Hui Chun-tak said the solution was “relatively mild” and its level of force the same as pepper spray. One Twitter user clarified the translation of the Chinese name (催淚水劑) as a “tear jerking water sol’n.” Scholarism kept up a live feed throughout the night, and at one point referenced the arrests in Ferguson in conjunction with arrests in Mong Kok. Apple Daily reported that although the injunction’s instructions specified only Argyle Street for clearance, police also removed barricades at the intersection of Shandong Street 山東街; SCMP also reported similar instances of police removing barricades beyond the parameters of the court order. Some 7,000 police officers had apparently been involved in the struggle that night, SCMP reported. (Here’s the NYTimes article covering the night and part of the following morning.) That night, the Hong Kong government issued a press release re-confirming that the police would be on-hand to assist bailiffs with the clearance of Nathan Road the following day and warning any protesters who might try to obstruct them. There is no section in the Race Discrimination Ordinance that binds the government in its exercise of powers and performance of functions. Since the police are part of the government, they’re exempted from the current Race Discrimination Ordinance. Pretty nuts, huh? The clearance of Mong Kok continued in the morning of Wednesday, November 26. A large group of men wearing bright red hats and white shirts reading “I ♥ HK” appeared, and no one was quite sure exactly who they were, such as if they were random citizens who’d showed up en masse, or if they were a volunteer group or some other group that was supposed to be assisting with the clearance. Even SCMP was not sure who they were, suggesting they might be “cleaners,” noting that they recognized faces of drivers from the company that had applied for the injunction. I heard the group left after a while, but they must have returned at some point because there are photographs of them taking apart barricades (scroll very, very far down). A group of civilians wearing red hats and T-shirts sporting the slogan “I love HK” moved among the crowd with the bailiffs. They are believed to be cleaners who will help with the clearance and include some familiar faces from taxi driver groups who have been calling for the protest to end. Here’s a video showing the red hats trying to take down barricades before getting into some kind of spat – someone holding a yellow Lion Rock banner yells at them, “香港唔係你啲嘅!” (“Hong Kong isn’t yours!”) – and it looks as if either the bailiffs or police (wearing vests) pushed the barricades they’d been taking apart back together. The video then cuts to police helping to carry out the court order, ordering people to get out of the way and dismantling tents. At 10:40am, Scholarism reported that a number of its members had been arrested, including Joshua Wong (here’s a video he recorded prior to his arrest calling for LegCo members to resign and force a referendum). Here’s a great photo of Lester Shum being arrested – the look of defiance! No wonder he’s got a fan club. By 11am, people were clearing out the Guan Yu temple as the police approached, while others carried away the cross from the Chapel on the Street. Other protesters merrily promised to meet the police at the Star Ferry pier, which was the site of another major protest in December 2006 over the demolition of the historic landmark. Journalist Kris Cheng reported that by 11:30am, the police were removing the last of the barricades at Dundas Street. I arrived right about noon, as a huge crowd made of a number of protesters and an equally large number of reporters gathered, facing a line of policemen at the barricade. A woman stood between the two lines, holding a slightly-broken yellow umbrella. Shirtless Graffiti Guy roved through the crowded sidewalks with a small megaphone. It was slightly difficult to maneuver around the Nathan Road area because every intersection that went across it was blocked off by police. Crowds of onlookers stood and watched the police at various intersections. At the MTR stations, you could see staff people scraping off posters and tape; I caught a glimpse of a crane on Nathan Road. At about the same time, the Hong Kong Federation of Students released a statement (Chinese/English) in response to the police violence on the previous night, criticizing the lack of clarity and transparency in the process of the clearance. By 3pm, SCMP reported, the roads were opened again. That night, masses of pro-democracy supporters began to rove the streets of Mong Kok, declaring that they were following orders given by CY Leung, and supported by groups like Scholarism, to 鳩嗚. 鳩嗚 sounds like the words in Mandarin for 購物 (go shopping). At a press conference he held before leaving for a short visit to South Korea on the 25th, Leung called on “shoppers to return to the cleared area. […] As business in the area has been hurt by the occupation, Mr Leung asked consumers to return and shop there after the clearance.” There’s also a story going around that a woman in a pro-Beijing protest said she was actually just in the Mong Kok area to 購物. This all therefore gave rise to the exuberant new “Shopping Revolution,” known also as #9wu (9 in Cantonese is phonetically similar to 鳩). SCMP has some great, in-depth and detailed coverage, but its biggest fault lies in the imprecision of its dates and times – it’ll post on one day, update another day, and still use the word “yesterday,” “earlier,” or “today” in the article without clarifying what those relative terms mean in specifics. Due to that confusion, I think that this otherwise excellent piece on Mong Kok and the start of the “shopping” resistance refers primarily to events on the day of the 26th, for instance, referring to “9pm” on the 26th. It describes the crowd calling, “I want shopping!” alongside shouts for “I want true universal suffrage!” and touches on the arrests of the various protest leaders. Absolutely worth reading. The two-month-long occupation may have attracted the world’s attention but it has yielded only minor concessions: a government report to Beijing that will reflect the public’s sentiments and a platform that would be set up to gauge views on further constitutional changes beyond 2017. 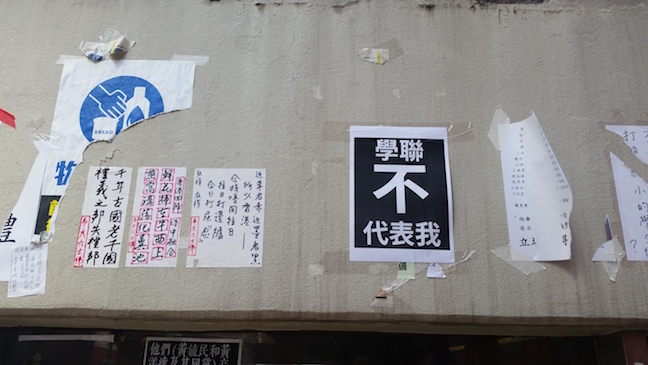 By the morning of the 27th, all of Nathan Road had been stripped of tents, umbrellas, and other large paraphernalia, though many of the stickers and chalk images still remained on the streets and signs. SCMP reported some 6,000 officers would remain the area to ensure that people couldn’t take back the streets, noting that already 148 protesters had been arrested since the clearance began. Here’s a video with a good recap of the clearance and the violence. The Hong Kong Journalists’ Association issued a condemnation of the arrests of journalists, speaking specifically on the arrest of an Apple Daily reporter; the following day, SCMP released a video contradicting police claims that the reporter had assaulted the police. It’s a pretty shocking video when you realized how tame the Apple Daily reporter seemed to be – it certainly doesn’t seem like he tried to assault police, but rather more like he appeared with a camera and the police randomly turned on him and singled him out for tackling. That night, thousands gathered to watch billboard advertisements on Sai Yeung Choi Street (for some reason WordPress won’t let me directly link right now, but here it is: http://hongwrong.com/occupy-movie-trailers/). On the 28th, Scholarism announced that HKFS and Scholarism would not be reclaiming Mong Kok for the time being due to another larger action to be carried out at the government offices at Admiralty. Another reason for not reclaiming Mong Kok was that many student leaders and other activists who faced charges at Kowloon City Court for obstructing bailiffs were prohibited by the court from entering the area previously occupied. Joshua Wong, who’d received that ban the day before, had also been pelted with eggs outside the courthouse. The 9wu Revolution continued to grow each night, with more people embracing the call to go shopping in Mong Kok. It was the new kind of resistance, rather unique to Hong Kong – to adopt this form of humor as a sort of obedient defiance, to protest while pretending to be another shopping tourist from the mainland. 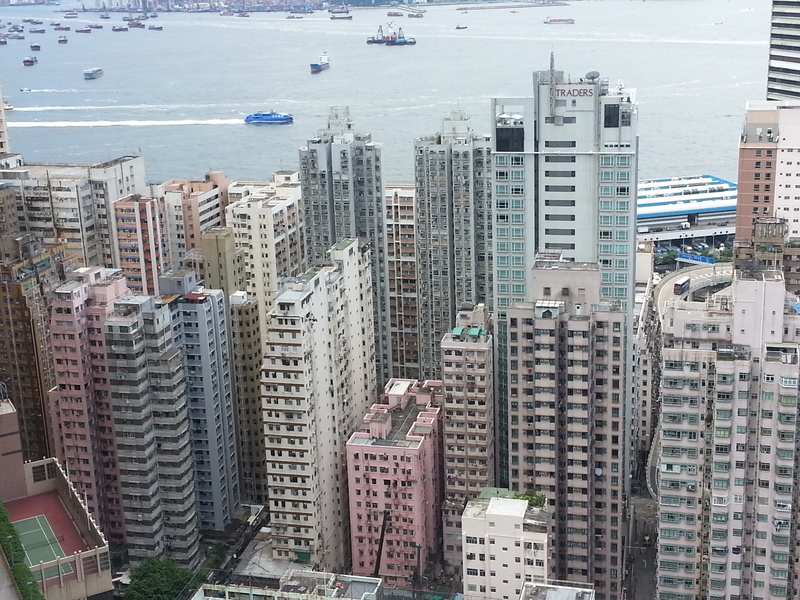 See http://hongwrong.com/mongkok-runaround/ for a great photo essay. My birthday was the following day, November 29, and one of the EM friends joked to me that it was a great time to 9wu in celebration. In a sequence of events that seem a little too coincidental, my boyfriend and I did end up shopping in Mong Kok that day. The weather had taken a turn toward the cold and the wind, and I needed a better jacket; afterwards, we went to watch Rise of the Legend, a kung fu movie about Wong Fei-Hung, the hero who’d be cited weeks earlier for his dangerous umbrella-fighting. And it just so happened that the movie theater was on Sai Yeung Choi Street 西洋菜街, with the exit located at the exact spot where a massive crowd of “shoppers” had gathered. This guy is out every night in the same pose! I suppose that whole day was an especially choice night for shopping. People brought flags with them, projected their love for shopping on walls, made remixes of old Cantopop songs (credit to HKGolden), and re-imagined an old YouTube challenge, “Race the Tube,” as the “購物挑戰 Shopping Challenge.” From 2am to 6am in the morning they walked from Mong Kok to Tsim Sha Tsui, applauding police for giving them “protection” along the way. My tone shouldn’t be mistaken as making light of the protesters, who were still putting themselves in danger of more police abuse. This video, using both photographs and clips, shows riot police with helmets confronting protesters, ordering them to disperse, to stop throwing things at the front lines. The police continued to push protesters out of the Mong Kok area toward Tsim Sha Tsui. And of course, despite claiming to be dutiful shoppers, some recalled the popular feeling that local Hong Kong people and visiting mainland tourists received unequal treatment (though many people in Hong Kong from the mainland feel that they are the ones being treated unfairly). Ming Pao also released the results of a poll on the 29th that they’d conducted in late October with over 1,500 protesters. It really shows the connections between protests in Hong Kong over time, such as the finding that 63% of participants had previously been part of the demonstrations against National Education, and a number of other findings are amazing as well – such as that students only form 26% of protesters, while 58% are white collar/self-employed; and that over 50% of participants have university degrees. On the morning of November 30, news of the results elections in Taiwan, which had been held the previous day, emerged. The 國民黨 Kuomintang, which has a long and complex history in Taiwan that I won’t get into here, is known as pro-China party, and it suffered a massive defeat as the Democratic Progressive Party 民主進步黨 swept the elections; this included winning the mayoral seat of Taipei, marking the first time in 16 years that the mayor would not be with the KMT. The Taiwanese premier, Jiang Yi-huah 江宜樺, resigned in response. But even members of the police were criticizing the government’s lack of a real political response; some had even resigned from their posts to join the protesters. I find this article in The Diplomat, published on November 20, quite interesting because of its synthesis of various protests throughout the Asia Pacific region. The author suggests many protests occurring in Hong Kong, Taiwan, Thailand, Indonesia, and South Korea are due to a “Democracy Gap” – nevermind that Taiwan, Indonesia, and South Korea are democracies (and even Hong Kong has limited elections; the big problem here is universal suffrage in elections for the Chief Executive) – and that corruption, decreasing press freedom, and growing economic problems have also contributed to unrest. It’s rather funny that the article begins by suggesting that Asia is experiencing an “Asian Spring” like the Arab Spring, and then concludes the two regions can’t really be compared. My sense is that the rise of China, and growing local economic inequalities that are related to China’s political and economic influence, are perhaps the biggest commonality behind these protests; I don’t know enough about Southeast Asia to talk about what’s happening there, though. I also didn’t know about this video of the police confronting Shirtless Graffiti Guy, way back on November 16; protesters attempt to block the police and shout, “黑警!” (black police), among other choice curses. I also read news of discrimination against a Pakistani man trying to open a bank account. It’s really disappointing to read – to hear that not only are banks reluctant to serve people of certain nationalities and ethnicities due to the notion they might be “terrorists,” but that under the current Racial Discrimination Ordinance nothing can be done about this treatment. I haven’t followed up on the EOC’s review of the law lately, but I hope to do that soon. Very interesting and informative take on the events surrounding OccupyHK. It’s been a constant series of nose-to-the-smartphone reading of Twitter updates and news articles, so it was refreshing to get a recap of things. And now am glad to finally know what “9wu” means!